Very cool, for so many different reasons. This is the type of thing most people would never consider to be within Excel's capabilities. Also thanks for linking to how bar codes work. And this is way on the manual side, still. 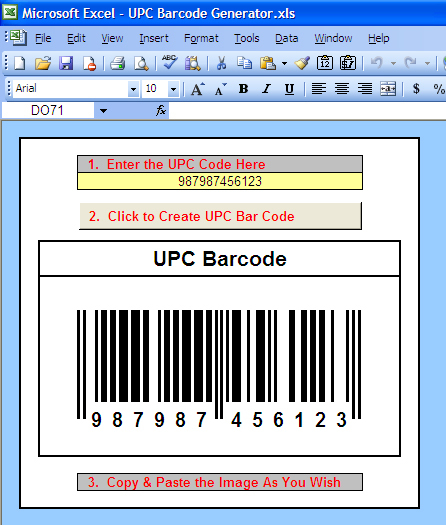 Using this as the basis, one could create a system that automatically creates barcode images to use in mail merge applications en mass. For example, each afternoon, an e-tailer might run a script that dumps all their SKUs that sold that morning, and print out all the invoices, including UPC codes, or mailing labels, or packing slips, etc. My rule of thumb: If in doubt, it can probably be done in Excel. Camera tool is not gone in Excel 12. It can be found under Excel Options -> Customize -> 'Commands Not in the Ribbon'. They also have a live support to help you with your questions/concerns.